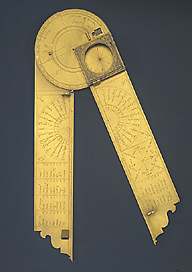 This folding rule is made up of two wide, flattened limbs, on which numerous marks have been engraved including the degree-scale, the shadow square or height-measuring scale, the wind rose and other measures. A compass is located at the joint of the limbs. As illustrated in treatises of the period, the rule could measure heights and distances, both terrestrial and astronomical, with the help of a ruler which has been lost. This example of the instrument, in simple brass, was designed to demonstrate the concrete use to which it could be put. It is practically identical to the 'dedication' example given to Grand Duke Cosimo I de' Medici, also conserved in the Medici collection (Epact 89029).